When I was younger, I read voraciously. So much so that I actually got in trouble (in a very mild way) in elementary school for getting too absorbed in what I was reading. However, the transition from children's chapter books to adult fiction was hard for me. The adults around me recommended mystery novels and historical fiction, but that just didn't take. I briefly flirted with trying to read my way through all of the classics, but, frankly, some of those books are just a slog--more like the reading you do for an English class because you must, not the reading you do for fun. Over time, I became more of a magazine reader than a book reader, and when I did pick up a paperback, it was almost certainly non-fiction. I still love my popular science books (looking at you, Mary Roach! ), but I'd like to add more fiction to my repertoire. Unfortunately, I still have the same problem of not knowing where to start. Wandering through a bookstore last week, I had an idea--what if I worked my way through the fiction section alphabetically? Not reading every single book, of course, but grabbing something that catches my eye starting with the A's and working my way on down to the Z's. 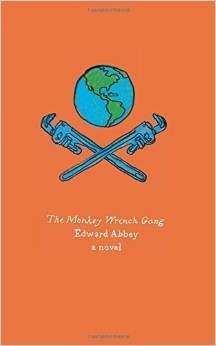 This lead me to my first selection, 'The Monkey Wrench Gang,' by Edward Abbey. Years ago, I was admonished at an animal behavior conference for never having read Edward Abbey. Luckily for me, it was neither part of the admissions requirements for my biology program nor a requirement for my Master's degree. At the time, feeling like a bad biologist, I tried to read one of his other books, and I just couldn't get into it. But 'The Monkey Wrench Gang' is apparently popular enough to be included in the Harper Perennial Olive Editions, so I am optimistic that this one will work out, and then I will finally have earned the right to be an obnoxious environmentalist. Do you read fiction? Have any recommendations for me?